Who can build your iPhone app? Last night my friend Doc Pop asked me for a recommendation of who could build an iPhone app for his performance and art. Doc is a force of nature: he blogs, is a nerd core rapper (who is releasing a new album of all-iPhone music), a world-champion yo-yo’er, comic creator, and does other arts and crafts in addition to his day job as an iPhone game designer. So of course he should have his own app. Gizmodo’s new comprehensive review of iPhone apps evaluated many more than I did (“ten zillion”), but matches my own experience. We both narrow it down to Tweetie vs. Twittelator Pro. I’ve been switching back and forth between the two for the last month or two. Either is a great app with the edge for smoothness going to Tweetie (which also seems to display more tweets on the page). The edge for pure power goes to Twittelator Pro. 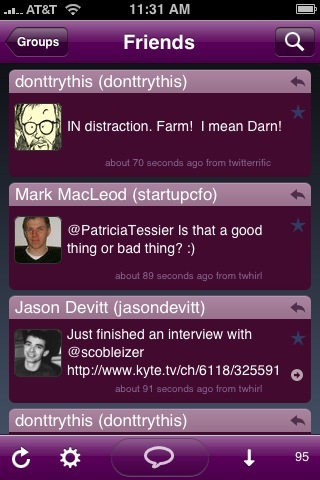 Twittelator has a great feature I wish was included in other iPhone apps: a button to scroll down a whole page at a time. This is especially useful in catching up with a long list of tweets. This is the only app I’ve seen with this functionality, so it’s a nice innovation. 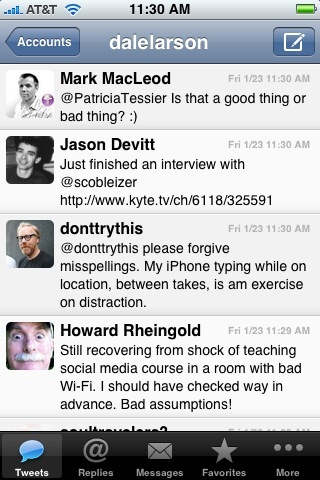 The other power feature I make use of in Twittelator is the ability to define my own saved searches. I can’t think of anything in Tweetie that Twittelator doesn’t do (well, there are fart noises and the flashlight if you enable the Popularity Enhancer). Despite all that, my current swing is in favor of Tweetie, though I still switch it up. Which do you prefer?